Jazz band: image via cherryflava.comI was treated to an outstanding jazz concert just the other night, and listening to the members of the ensemble spontaneously converse through their instruments was so incomparably stimulating that I felt I was in another universe. I was. But before I could keep the promise I made to myself that I would take up jazz piano, I found some related reports of recent research on music, jazz music, and the brain conducted by neuroscientists and psychologists at Johns Hopkins University and the University of Liverpool. Oscar Peterson, one of the great jazz pianists: image via wikipedia.comThe first study of interest, led by Dr. Charles Limb of Johns Hopkins, involved 14 proficient jazz pianists, and was undertaken to learn what areas of the brain were involved in communication between the musicians. 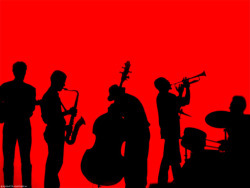 Jazz music was chosen for the study because it often involves spontaneous communication between players, unlike, for example, classical music, which is scripted. 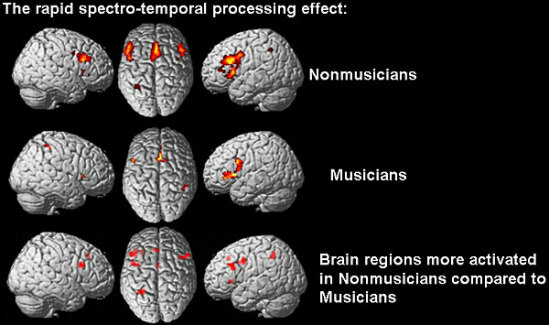 The musicians were asked to improvise four bars of music ("trading fours") while their brain synapses were monitored by a magnetic resonance imaging (MRI) machine for 10 minute periods. The MRI recorded brain signals not only when each musician was playing his 'fours', but while he was listening to another's fours. (All subjects in this study were males. What Limb and his researchers found was that the same areas of the brain activated by language processing and syntax were activated by the music, but they did not involve the areas that processed semantic language (or meaning). Similar results were found by researchers at the University of Liverpool's Institute of Psychology, Health, and Society; its studies showed that both spoken language and music lit up the same areas of the brain, although the specific style of music was not emphasized. The first study they conducted compaired the MRI images of 14 musicians and 9 non-musicians while they participated in a word generation and music perception task. Although each group was given the same exercises to perform, the musicians' MRIs showed shared brain pathways for the word generation and the music perception exercises, while the non-musicians did not show shared brain pathways. After only 30 minutes of muscial training, the MRI's of the non-musicians showed the similarities in blood flow as the musicians MRIs had shown in the prior study, that is that language and musical imput followed the same brain pathways. 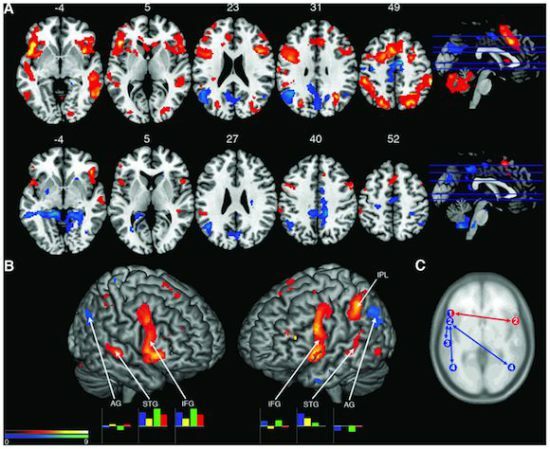 Supervisor of the study, Dr. Georg Mayer, said "This suggests that correlated brain patterns were the result of using areas thought to be involved in language processing.... We can therefore assume that musical training results in a rapid change in the cognitive mechanisms utilised for music perception, and these shared mechanisms are usually employed for language." These most recent studies add to the volume of previous studies on music and brain plasticity for persons of all ages, and form the underlying basis for the considered success of music therapy in treating a realm of disorders of the young and old - a subject for another day. GPSports Tracking Device: It's a Bra; It's a Bro; It's Wearable Tech!